The AFC Championship game on January 7, 1979 featured the Pittsburgh Steelers, seeking to return to the Super Bowl after falling short the previous two seasons, against the division-rival Houston Oilers. Under Head Coach Chuck Noll, the Steelers were in the playoffs for the seventh straight year. 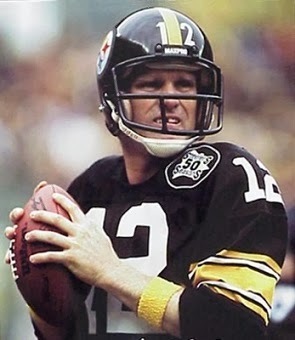 In his ninth season, QB Terry Bradshaw (pictured above) was at his best and had wide receivers Lynn Swann and John Stallworth to pass to while FB Franco Harris was a consistent ground-gainer, in tandem with HB Rocky Bleier. The “Steel Curtain” defense was well-seasoned and still sound, featuring DT “Mean Joe” Greene, DE L.C. Greenwood, MLB Jack Lambert, OLB Jack Ham, and CB Mel Blount. Pittsburgh topped the AFC Central with a 14-2 record, splitting the season series with the Oilers, and easily dispatched Denver in the Divisional playoff round. Houston was coached by O.A. “Bum” Phillips for the fourth year and was in the postseason for the first time since 1969, the last year of the American Football League. The key player on offense was FB Earl Campbell, the power-running Heisman Trophy winner out of Texas who led the league in rushing as a rookie (1450 yards). QB Dan Pastorini had a good year and benefited not only from Campbell’s running but the break-out season of TE Mike Barber. The defense was solid and included DE Elvin Bethea, MG Curley Culp, and LB Robert Brazile. The Oilers went 10-6 to finish second in the division to Pittsburgh and defeated Miami in the Wild Card playoff game and the Patriots at the Divisional level to advance to the AFC title game. It promised to be a rugged contest. The last time the teams met during the regular season, 13 players were injured during the course of the game, including Earl Campbell, who suffered a broken rib. 49,417 fans were in attendance on a wet day at Three Rivers Stadium, with a cold rain leaving puddles scattered on the artificial surface. The precipitation occurred throughout the contest, but the partisan crowd was enthusiastic and waved their “Terrible Towels” in earnest. The tempo was set on Houston’s first play when Earl Campbell took a handoff and was tackled by Jack Ham for a loss of two yards. The Oilers went three-and-out and punted, with WR Theo Bell returning the kick 12 yards to give the Steelers good field position at their own 43. They went 57 yards in five plays, the biggest a pass from Terry Bradshaw to Lynn Swann for 34 yards. Franco Harris ran for a seven-yard touchdown, Roy Gerela kicked the extra point, and Pittsburgh had the early lead. Following another Houston series that ended with a punt, Bradshaw completed back-to-back passes to TE Randy Grossman that picked up 29 and 14 yards, respectively, to reach the Houston 21, but two plays later CB Willie Alexander came up with an interception. The Oilers weren’t able to take advantage – two plays after that, Mel Blount returned the favor by picking off a throw by Pastorini, and his 16-yard return gave Pittsburgh the ball at the Houston 26. The Steelers couldn’t move in three plays and Gerela’s 40-yard field goal attempt fell short. Once again the Oilers gave the ball back as Campbell fumbled and Ham recovered for Pittsburgh at the Houston 17. Harris fumbled the slippery ball on the next play, but the Steelers maintained possession and Rocky Bleier (pictured at right) went around right end for 15 yards and a TD. Gerela added the PAT and Pittsburgh took a 14-0 lead into the second quarter. The ball was hard to handle and, at one point in the second quarter, there were fumbles on three consecutive plays. Bradshaw fumbled on first down from his own 32 and, while the Steelers recovered, it was at a cost of 20 yards. Harris carried and lost the handle on the ball, with Robert Brazile recovering for the Oilers at the Pittsburgh 19. Campbell then fumbled on Houston’s first play, but managed to recover, and the Oilers, helped by a pass interference penalty, advanced to first-and-goal at the four. They couldn’t reach the end zone and settled for a Toni Fritsch field goal of 19 yards to at least get on the board. The Steelers responded by driving into Houston territory, with Bradshaw scrambling for 13 yards and then passing to Swann for 18. But two plays after Bradshaw connected with Bleier for a 16-yard gain to the five yard line, he was again intercepted, this time by CB Greg Stemrick in the end zone. L.C. Greenwood sacked Pastorini on the next play and Houston went three-and-out and had to punt. Harris fumbled twice on the ensuing series, the second recovered by the Oilers at their own 30. The clock showed 2:16 remaining in the half, but before it was over the Steelers put the game out of reach. Pastorini threw to HB Ronnie Coleman, but after he gained 15 yards, Ham stripped the ball away and made the recovery. Four plays later, and with the clock down to 52 seconds, Bradshaw connected with Swann for a 29-yard touchdown. The extra point put the Steelers ahead by 21-3. On the ensuing kickoff, WR Johnnie Dirden fumbled the return and HB Rick Moser recovered for Pittsburgh at the Houston 17. After a run by Harris gained nothing, Bradshaw threw to John Stallworth for a touchdown from that distance. However, the first half scoring still wasn’t over. On Houston’s next play, Coleman again fumbled and DT Steve Furness recovered at the Oilers’ 24. Gerela kicked a 37-yard field goal and, in a matter of less than two minutes, the Steelers had scored 17 points and taken a commanding 31-3 lead. The second half was only a formality. The Steelers had the first possession in the third quarter and punted, but two plays later Ham intercepted a Pastorini pass and it set up another Gerela field goal, this time from 22 yards. MG Ken Kennard recovered a fumbled handoff for Houston at the Pittsburgh 20, but SS Donnie Shell intercepted a Pastorini throw that gave the Steelers the ball at their one yard line. The Oilers did come up with points when LB Ted Washington tackled Bleier in the end zone for a safety, but that was it. Houston’s next two possessions ended in interceptions as the Steelers continued to dominate on defense. Pittsburgh won the AFC title by a final score of 34-5 and moved on to the Super Bowl. The teams combined for 12 fumbles, breaking a 45-year-old NFL record. The Oilers lost four of their six fumbles and also gave up five interceptions (four in the second half alone) on the way to a staggering total of nine turnovers. Pittsburgh turned the ball over five times, three on fumbles and twice on intercepted passes. The Steelers outgained Houston by 379 yards to 142, running for 179 yards while holding the Oilers to 72 rushing yards – their seventh straight contest in which they held their opponent to under a hundred yards on the ground. Pittsburgh also recorded four sacks, to none by Houston. Terry Bradshaw completed 11 of 19 passes for 200 yards and two touchdowns with two intercepted. Franco Harris ran for 51 yards on 20 carries that included a TD, and fumbled four times in the first half, losing two. 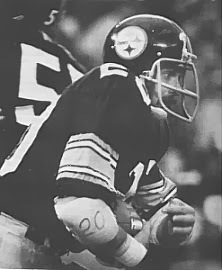 Rocky Bleier contributed 45 yards and a score on 10 rushing attempts and also caught four passes for another 42 yards. Lynn Swann also had four pass receptions, for a total of 98 yards and a touchdown. 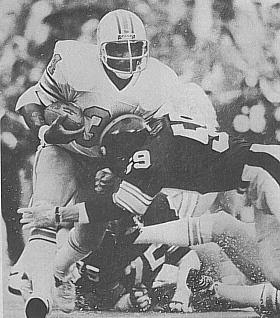 Defensively, Jack Ham (pictured below, tackling Earl Campbell) had a sack, an interception, and recovered two fumbles while Jack Lambert was credited with 11 tackles. Earl Campbell was held to 62 yards on 22 carries and fumbled three times, losing one. Dan Pastorini was successful on 12 of 26 throws for 96 yards with the five interceptions. TE Rich Caster had 5 catches for 44 yards and FB Tim Wilson also caught 5, for 33 yards. The Steelers went on to defeat the Dallas Cowboys in the Super Bowl and repeated the next year. The Oilers again finished second in the AFC Central in 1979 and advanced once more to a showdown with Pittsburgh for the AFC Championship, which the Steelers won by a score of 27-13.